. : Help Meister - Partners :. A learning curve for your sales force that makes them ready to compel orders in 2 hours. An easy ancillary sale to your current offerings. Help Meister is applicable to anyone wishing to add professional-quality help to their website, that is, just about every one of your customers. A quick sale since subscription pricing is within almost everyone's immediate signature authority. A way out of collecting money. Help Meister does that for you. Would you like a sale that keeps paying every month? 2. Software Integrator - One advantage of a web service is how easily it integrates with other software. If you need to provide online help as part of your application, let us show you how that can be a component we can provide faster, easier, and cheaper than doing it yourself. Professional writers who can produce clear, informative help records..
Training organizations who can reinforce online help with education. HR management firms who can insure that online help integrates well with a client's policies and procedures. Translators who can produce help in foreign languages. This is where a Value Added Reseller comes in, typically with a proposal to your client that includes Help Meister and the services to produce a complete service package. Usually, this is priced at many times the cost of Help Meister alone. And this is the best part - we become your collection agent, rolling your fee into the subscription price and making your past due collection problems a thing of the past. 4. Membership Groups  If your membership organization represents trade or business professionals, you may wish to add Help Meister to your affinity programs. Much like our Reseller Program, we provide a discount code for your members. They pay less than our standard prices as a benefit of joining your group, and your group earns a fee that can go to funding your programs. If you are a Help Meister trail blazer, we invite you to join our Business Partners. We are committed to helping uncover new Help Meister applications in areas that are profitable for our Business Partners. The process begins with an application form you use to introduce yourself and your plans. You are assigned to a Partner Advocate who responds by either approving your application or suggesting ways to improve your value proposition. Once onboard, we assign you a RefCode that we use to track your commissions. Whenever a Help Meister customer first signs up, they can enter a RefCode as shown to the right. This identifies them as your customer. As a Business Partner, you are also assigned an account on our members-only Business Portal section. With your RefCode and a password, you will see a page like the one below showing your sales commissions, as well as a place to set your prices for Help Meister sales. Custom website development addressing your specialized community with a URL like www.Helpmeister.com/MySpecialty. This may include focused content you provide and signup forms automatically channeling into your commission structure. 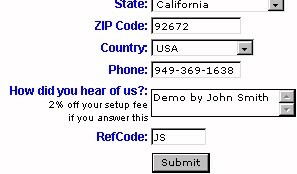 Development of custom demos structured like our baseline demo, but focused on your specialized Help Meister application area  and with the slides linking to your signup form. Co-development of marketing collateral like Powerpoint slides. Published authors ready to help you produce newsworthy articles for your community's trade magazines. Can I have people I train work at this with me? How often can I change my prices? These are negotiated person-to-person and depend on factors like how well matched your community is to Help Meister, how much you will do to make things happen, what you plan to charge, etc. We also typically give more of a commission on the signup fee for resellers and membership groups since that is where you often make your most important contribution. Such startup fee commissions can range from 20% to 50% with monthly subscription commissions around 10%. Value Added Resellers set their own startup and monthly commission rates. Part-time HR Managers (with experience) can charge several thousand dollars per month to develop and maintain help for an intranet, for example, and we may retain $50/mo to deliver Help Meister and to collect and pass on their fee automatically. Yes. And we can negotiate a separate RefCode for each person you bring aboard such that you share in their commission structure. If John Smith (RefCode=JS), for example, brings Linda Lewis aboard, her RefCode would be JS-LL. Each time a sale goes through for RefCode JS-LL, Linda Lewis gets her commission and so does John Smith. Such second-level commissions (to John Smith) are typically 2% to 10%. This borrows concepts from multilevel marketing, but remember a major difference. Whereas most multilevel marketing programs minimize the importance of the product being sold (often just household commodities) relative to their compensation formulas, we look first at the product. Our business model is not based on soap suds  it is built on Help Meister's rock-solid, proprietary value proposition and your specialized contribution. As often as you wish, every sale if you wish. If you prefer to walk your customers through the signup process, for example, you can have a price waiting for them that reflects your services to that particular customer and their payment expectations. 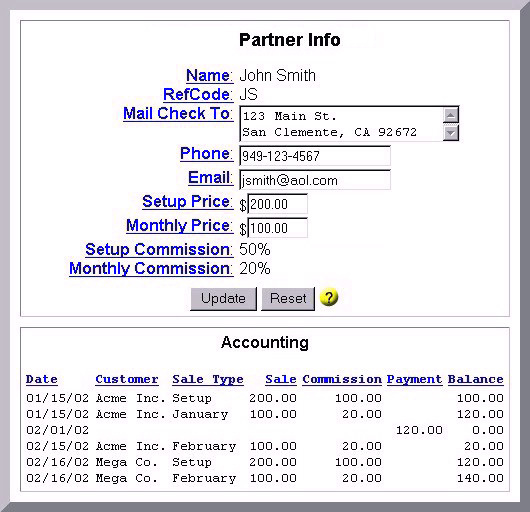 Copyright © 2002-2008 Bizware Online Applications, Inc. All rights reserved.